This page is the original introductory page. Things have changed - read to the end of page! 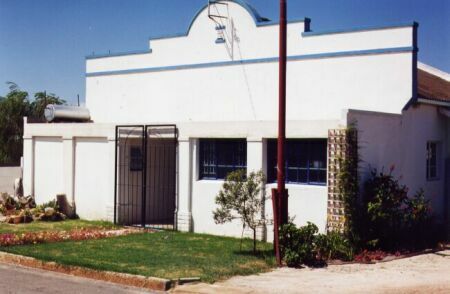 The first picture shows the Jail house and how it sits on the plot. It actually occupies less than half of the actual plot. Everything shown on the right is also part of the property. The next picture is a close up of the actual house. The bathroom is on the extreme left (No windows). 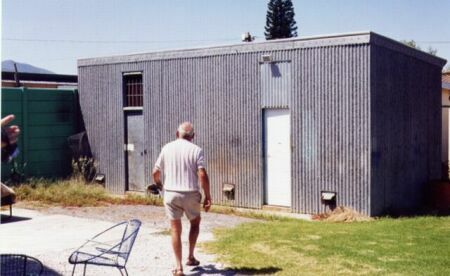 The enclosed verandah on the right with windows. A central alley (?) into the front of the house separates the bathroom and verandah. Common access is through the side door under the afdak. 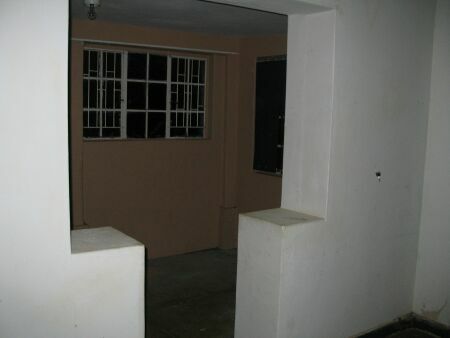 The most commonly used door is the side door and it leads directly into the main living room which was the court house. 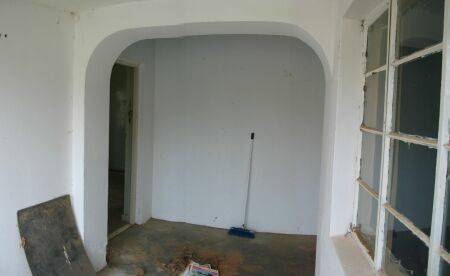 This picture was taken with my back to the enclosed verandah (facing east) and shows the common access door on the right, the kitchen and the access to the two bedrooms at left. 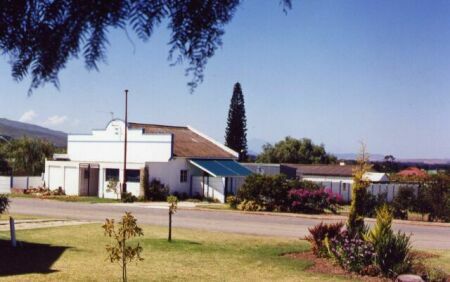 The court house or common living area as it is now runs from the enclosed verandah the whole length of the house to the back wall. There are no back windows. The next picture is of the living room facing west. 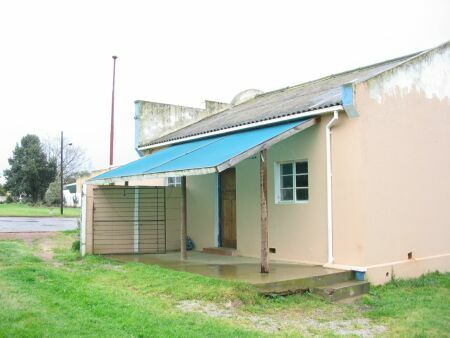 The verdandah is fairly typical of verandahs built in the fifties and is shown in the next picture. The living room is now behind me. Turning your back to the the Verandah entrance, the kitchen area, really only a sink and a wall unit isnext to the door way into the first bedroom. 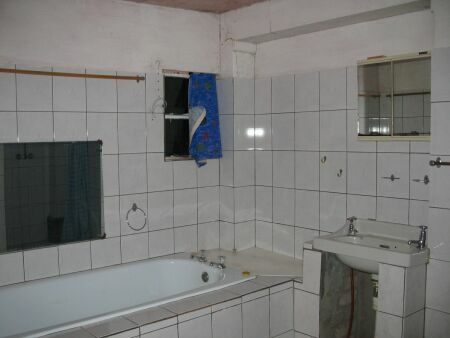 The first bedroom is a really small room and was at one stage a bathroom. 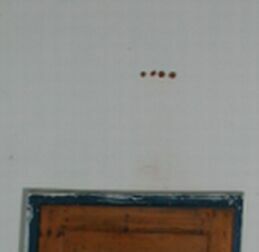 Toilet and wash hand basin marks are readily seen. It isn't really bent like this. I just didn't think of stitching it until long after the pictures were taken. 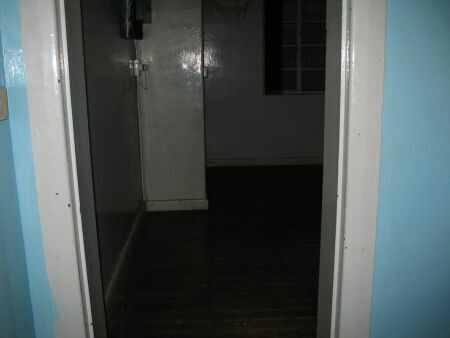 In this next picture you can see the door into the bathroom from the main bedroom. and leads directly into the bathroom and toilet. 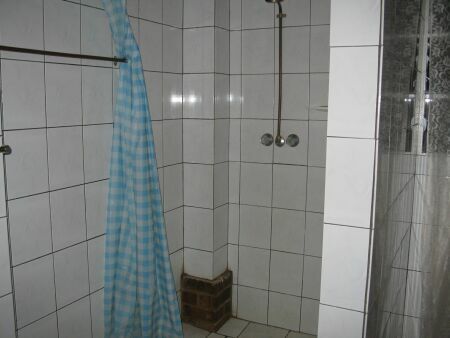 And a fairly large bathroom it is compared with modern arrangements. 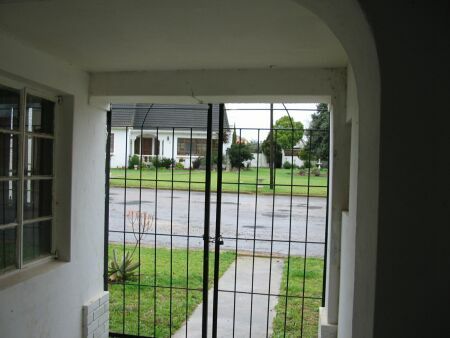 The front entrance is seldom used and is a bit of a conundrum. The first picture is facing inwards. The next picture is facing outwards. Yes, you guessed right. 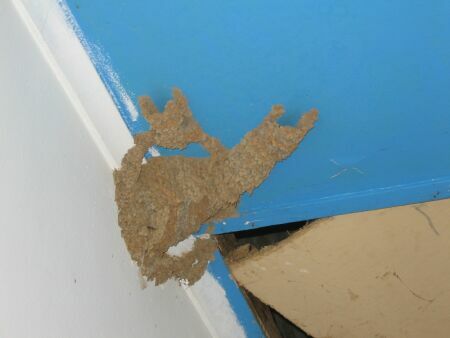 This is an OLD, well used swallows nest and for the life of me I cannot bring myself to close it in and lose my yearly european tenants. 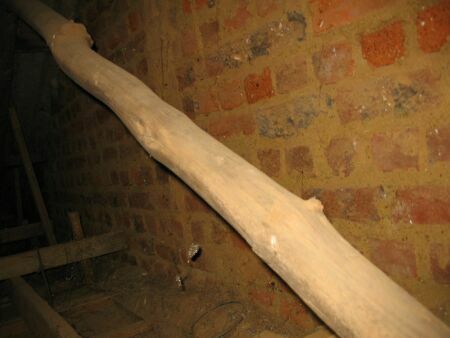 The joists are not hugely pretty, in fact they appear to be trees that have been debarked. 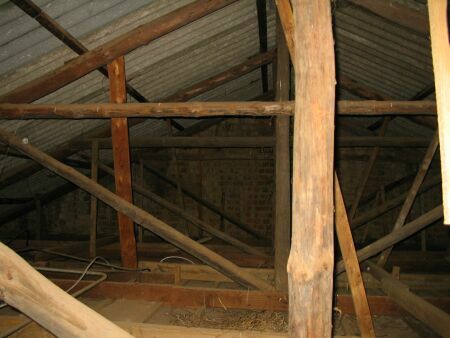 The following pictures show the inside of the roof. 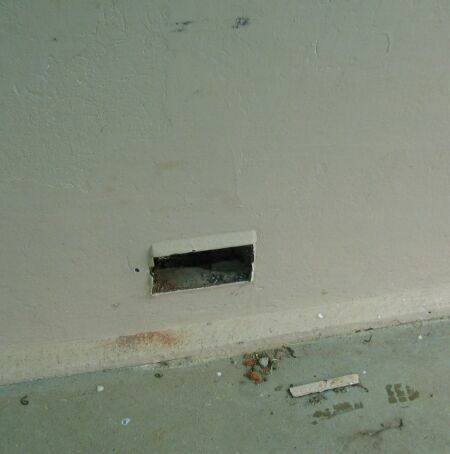 The actual holding cells are to the back of the house and are shown in the next picture. 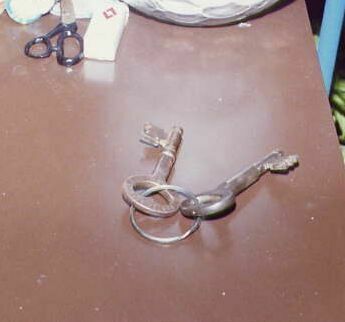 The keys are of awesome size as shown by the next picture. I cut a hole in the floor and did some diving. 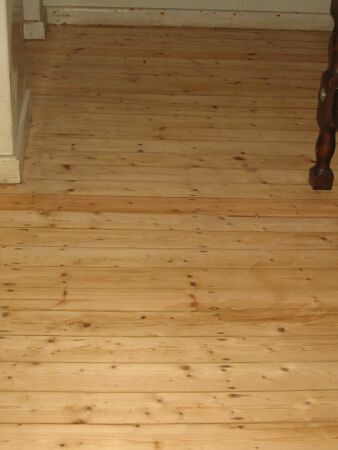 And made the sad discovery that the floor has borer beetle in it and needs treatment. Abri from Swellendam did the job. 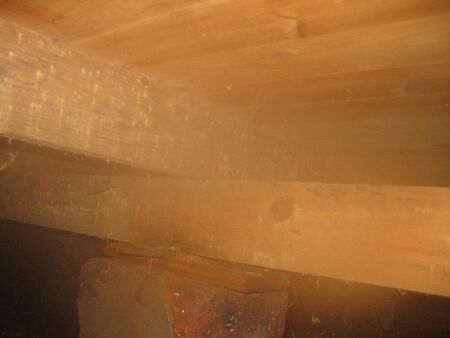 This picture was taken under the floor and shows supports and beetle tracks. The under-floor zone is terribly humid and you end up with the camera lens fogging up very quickly. 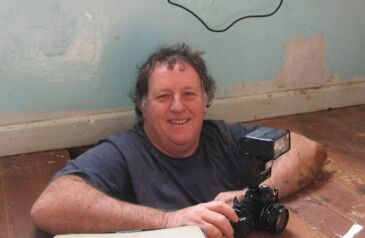 This picture shows how you might look if you ventured under the floor to take pictures. The beetle man, Abri told me that there was no underfloor ventilation. He was wrong, there is. Not hugely well planned or terribly effective, but there is ventilation none the less. Point is although he was wrong, he was also right in a way. The lack of ventilation was in the living area. Most of my tenants had complained that the house was "mif". I am not sure if there is a good english word for it, but it indicates a cold damp that causes fungus to grow on everything. 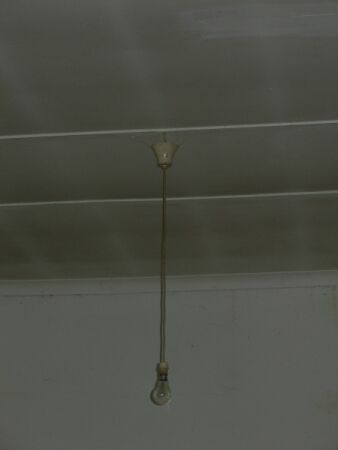 The next picture is of the ceiling in the living room, away from the shower and bath room. The fungus is overwhelming as you can see. The first time I slept there I left the windows closed (it was a very cold night) and all the windows were running with condensation. While scratching my head over Abri's comment about the lack of ventilation, I suddenly realised he had provided the answer, purely by accident. 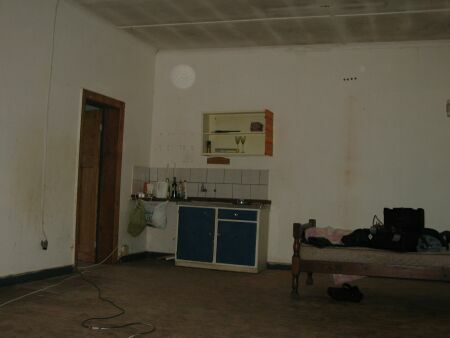 You see there are no ventilation holes in the living space. None. I went round twice to check that I had not missed. As an experiment, I drilled holes all over the place more or less where the ventilation holes should be. See the picture. I then went to bed with the windows closed. And (trumpet fanfare!!!) there was no condensation on the windows! Problem solved (at least I hope so!) Proper ventilators will be fitted asap to prevent the local bees from taking up residence. Interestingly enough you can feel the air flow through those small 16 mm holes. Inwards during the day when the outside temperature is highest and outwards when the inside temperature is highest. Went back to see Abri's handiwork. The floors look great. 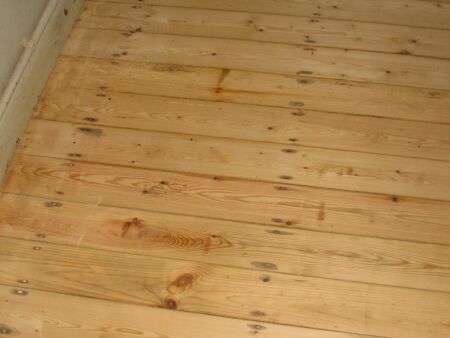 I haven't coated the floors yet as the ceiling needs painting and I am not gonna drip on newly varnished floors! You can still see the poison that he used to nuke the borer beetles. Hopeufully that is the last of that topic. The air in the house was much better, warmer, fresher. Those holes really worked a treat! Now I need to go back and fit proper ventilation grids. We converted the front verandah into a kitchen - temporary but still it works. 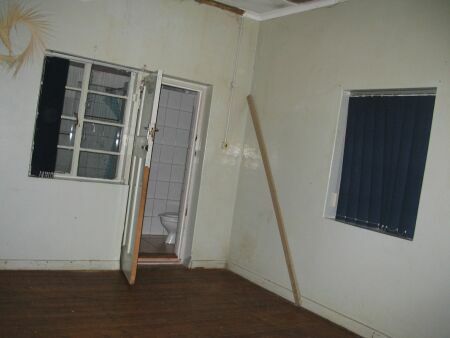 The bedroom adjacent to the bathroom is furnished and looks like this. The main bedroom - east end of the house now looks like this. The sitting room now has furniture and decorations. East side of the living room looks like this.